Paris Saint-Germain wrapped up a fifth Ligue 1 title in six years with Sunday's resounding 7-1 win at home to last season's champions Monaco. Unai Emery's side opened an unassailable 17-point lead at the summit with five matches remaining, completing a domestic double after their Coupe de la Ligue triumph over Monaco in March. 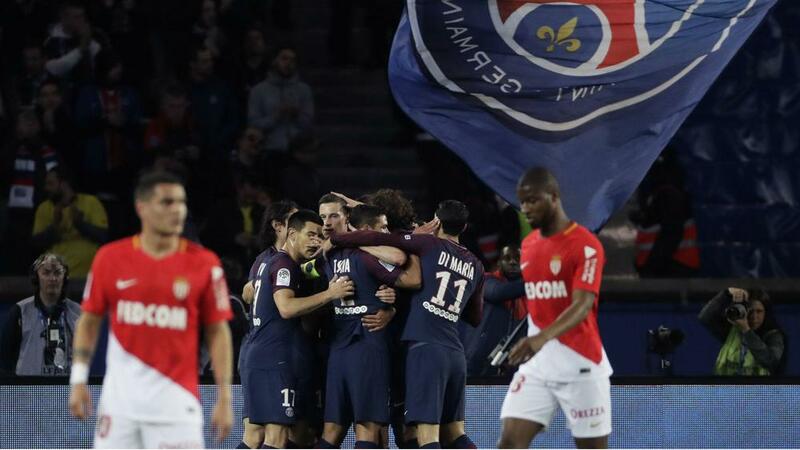 Giovani Lo Celso and Angel Di Maria scored doubles, with Edinson Cavani's header, an own goal from Radamel Falcao and Julian Draxler's strike securing an emphatic victory that guaranteed the trophy would be returning to Paris. Leonardo Jardim's Monaco won the hearts of neutrals last term with their swashbuckling style and faith in talented youngsters, but the sale of key players – including Kylian Mbappe to the Parc des Princes, initially on loan – coupled with PSG's all-out approach in the transfer market had the writing on the wall early in the campaign. PSG's first-choice attackers have unsurprisingly been crucial to them running away with the league, with Neymar transitioning seamlessly after his world-record €222million switch from Barcelona, scoring 19 and setting up 13 in 20 Ligue 1 games before fracturing a metatarsal in February. Mbappe has also enjoyed a solid debut season in the capital, though Cavani has led the way in terms of goals, scoring 25 times. Despite their success in two competitions, failure in the Champions League is likely to result in Emery moving on. The Spaniard arrived at the start of last season on a two-year deal having won three Europa League titles in a row with Sevilla, his expertise in continental knockout ties said to be a major reason for his hiring as PSG sought to upset the established order in the Champions League. However, after an embarrassing collapse to Barcelona in the round of 16 last term, they were dumped out by Real Madrid at the same stage this year. Former Borussia Dortmund coach Thomas Tuchel has reportedly been lined up as Emery's replacement, with the club looking to progress after two years of treading water.